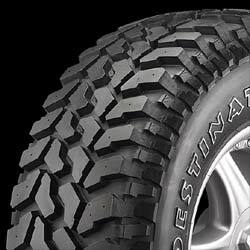 The Destination M/T is an Off-Road Maximum Traction tire developed to meet the needs of pickup truck and sport utility vehicle drivers who desire the looks and performance associated with rugged off-road driving. The Destination M/T is the first Firestone light truck tire to use UNI-T technology to combine off-road traction with enhanced on-road capabilities. UNI-T is a combination of technologies that merge a comprehensive design method with innovative manufacturing features to enhance tire comfort, performance and wear. The Destination M/T features a Long Link Carbon (a special form of molecular re-engineered carbon black) enhanced tread compound to improve wet performance and wear on the road while maintaining cut, tear and abrasion resistance off the road. The tread compound is molded into a symmetric tread design comprised of deep lugs and an over-the-shoulder tread/lug design that features alternating width shoulder lugs with a low 23-degree attack angle to provide the biting edges necessary to dig down, as well as, claw at the sides of ruts to generate pulling power. Rim Guard Off-Road Protector Ribs molded on the sidewalls help deflect off-road debris from between the tire bead and rim area, keeping the lower sidewall stiffer and allowing the bead to fit tighter to the rim. On the inside, the Destination M/T combines twin, high-tensile steel cord belts reinforced by a spirally wrapped nylon cap ply with Firestone's Dura-Loc 3.0 (a 3-ply polyester cord body) to enhance durability and highway stability.